Heat the oil in a frying pan. Stir fry the mushrooms for approx. 5 mins. Add the asparagus, spring onions and peas, stir fry for a further 5 mins. Pour in the cream, season. Mix in the herbs. Cook the tagliatelle in salted water until al dente, drain and reserve approx. 100 ml of the cooking water. Add the tagliatelle and cooking water to the vegetables, mix well. 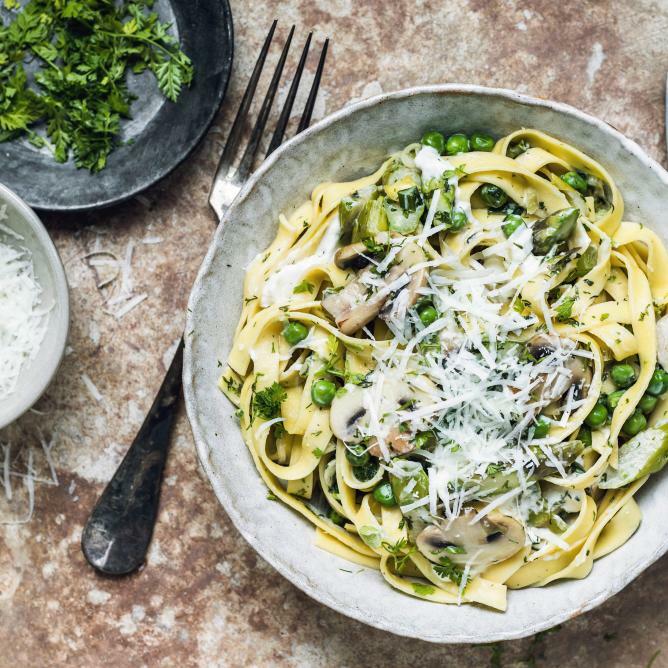 Mix the burrata in with the tagliatelle, scatter the cheese on top. Stir in 4 tbsp of the wild garlic pesto.